It's Yukimura's album! At long last! Renji and Sanada are on this album! THEY HAVE A SONG TOGETHER. SANADA PWNZ THAT SONG, TOO. IT'S EXCITING! Not as exciting as like, a Renji album, or Akaya album. OR A YAMABUKI ALBUM. Do you have any candy? Normally I don't want candy but today I'm wishing I had candy. I hope you have candy. Have some ear candy! This is a really nice album with the kind of thing we have come to expect from beautiful Yukimura Seiichi, and the 3-et with Sanada and Renji is just adorable! 04-01 Kuki Kiichi 4th single! 04-01 Ryouma and Kintaroh duet! 05-13 "Long-awaited BEST OF" ????? 05-13 Kuki Kiichi 5th single! In addition, paraphrased from Interchannel, with the release of the new OVA ANOTHER STORY, we are making theme songs and there are new groups to sing them. First up, the opening theme, a unit that Konomi-sensei named Seishun Soda (Ryouma, Tezuka, Momo, Kaidoh)! Next Osaka-type ending theme, based on the [ishi] connection, STONES (Oishi, Shiraishi, Ishida Gin, Kite Eishiroh)! 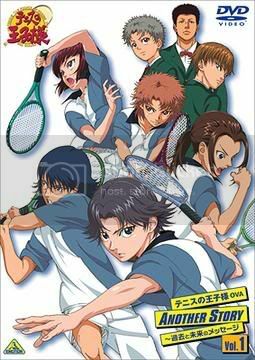 For a Hyoutei-type ending theme, from a couple of years ago, Hyoutei Eternity (Atobe, Gakuto, Piyoshi, Chotaroh)! They're really reaching trying to put our beloved Eishiroh in with the -ishi- crowd... they should have put in Ishida Tetsu!! Wait, they should have ADDED Tetsu-chan. Because Kite is AWESOME and he needs his own album. Don't you think? I agree Kite should get an album. And there's just way too many awesome people who still need albums, and I'm not even saying Koharu should get one, cause really just a Koharu single would be totally fine with me. Thank you so much for always sharing with us. More new groups!! Can't wait to hear wait they sound like together. Thank you so much for the album! why on earth don't i have a sanada icon? And Momo's being Shafted! D: Now Oishi has a second album coming out too? Poor Momo! Although, I guess we should have seen it coming. the golden pair are still married, after all. What one does, the other has to in kind. XD Maybe they should have just stuck the two albums together and made it a two disk set. That would really up the sales. Momo's totally being shafted! Or the VA is too busy with his other projects. It would be the cutest set evar if Oishi and Eiji had a double-album together! But then we would all want one of Fuji and Tezuka, too!!! At one point, I went like, "Man, Sanada will NEVAR get an album ;_; " and ... he did. SO THIS TOO COULD HAPPEN. OMG Thank you so much for this!